"Be nasty to nasturtiums and they'll be nice to you." Isn't that how the saying goes? Well, I wouldn't go so far as to be nasty, but as long as you plant these bright annual seeds in a sunny spot and something resembling garden soil, they will reward you with an abundance of blooms and interesting foliage until frost. I remember hearing that if you feed them, they will not bloom as well. It was interesting to paint this flower. Most blooms will keep for the time it takes to paint them if put in water and they tend to stay still. 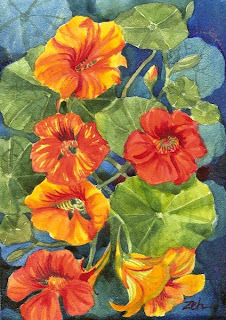 Well, the nasturtiums kept OK, they just didn't stay still. Everytime I looked at them, it seemed they had moved - swayed around to a slightly different position. The leaves did the same. I suppose as the cut plant took up water through the stem, it caused the plant to move that way. It was like the plant was dancing!